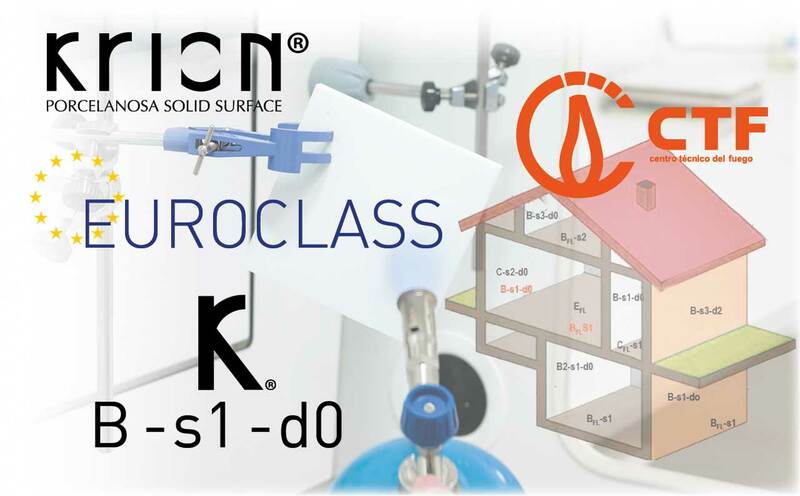 KRION® and its Euroclass B-s1-d0 classification. Does anyone offer more? A few years ago, each European Union country had its own specific requirements as to the characteristics to be met by products used in construction, including reaction to fire. This meant that the same material could be used or otherwise depending on the country where it was to be installed and the laxity of its internal regulations. All this changed with the creation of European Directive 89/106/EEC, which specifies certain essential and mandatory requirements for the free movement of products, thus creating the Euroclasses. KRION® is the only solid surface that has the B-s1-d0 classification for its standard product range. Other solid surfaces found on the market reach this classification in their high-end product range or special productions, thus also having a higher cost. What does the Euroclass B-s1-d0 indicate? Each of the three sections of the nomenclature indicates an important aspect of the material’s reaction to fire: contribution to fire, smoke opacity and burning droplets. CONTRIBUTION TO FIRE: This indicates whether a material helps keep a fire going. It is classified alphabetically, A being the safest rating (completely fireproof materials, e.g. stone) and F the least safe. KRION® is given a B rating whereas most solid surfaces on the market are C category. SMOKE OPACITY: Rates the density and opacity of smoke produced by the material, which indicates the level of toxicity. Only 3 grades can be obtained, s1 - s2 - s3, the order being from lowest to highest opacity. KRION® is classified as s1, the best possible rating representing the lowest health risk. BURNING DROPLETS: This rating indicates the material's ability to produce burning droplets that help spread the fire. The ratings are d0 - d1 - d2 depending on the number of drops produced in ascending order. KRION® is d0, the best possible rating, which means it does not produce any burning droplets that can help spread the fire. The acrylic component evaporates and is totally consumed, and the rest would be a fine powder which does not contribute to the fire.